This page will eventually cover links to a series of posts elsewhere on the blog on the River Quaggy including both the main river and the known tributaries. 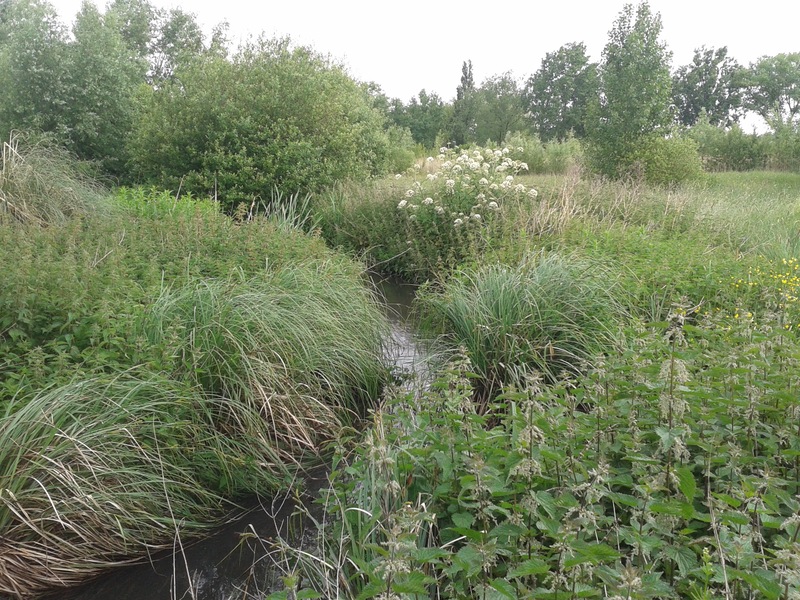 In doing this, I am following in the footsteps of a sadly departed fellow fluvial flâneur, Ken White, whose wonderful “The Quaggy & Its Catchment Area” is available from the Quaggy Waterways Action Group – QWAG. 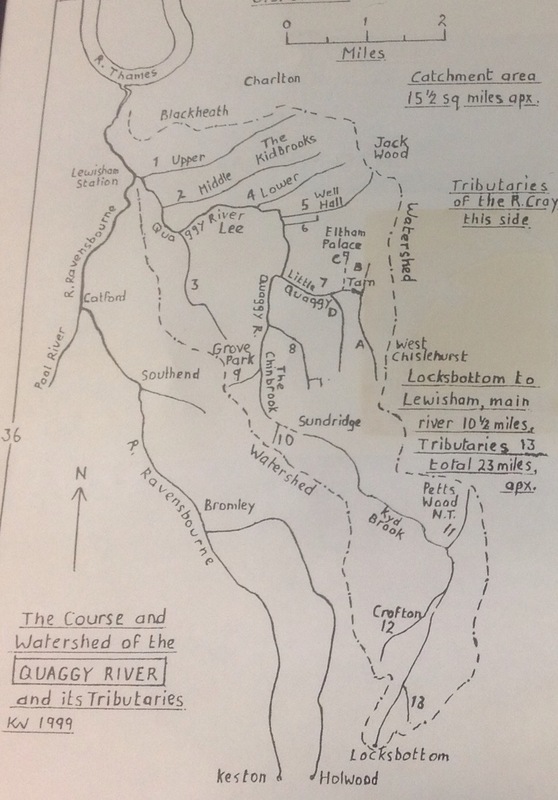 For readers familiar with Alfred Wainwright’s Pictorial Guides to the Lakeland Fells series, Ken White’s booklet has a lot of similarities in terms of style, hand drawn maps and diagrams – such as the map of the Quaggy and its tributaries, below (see footnote) and the beautiful handwritten text. I am not in any way trying to recreate Ken White’s work on-line. I prefer to use old OS Maps and the landscape itself to trace the watercourses. However, ‘The Quaggy & its Tributaries’, as well as a range of other sources, are there for when I need to double check or get some pointers where the brooks and streams flowed. Other than Quaggy itself, most of the watercourses have been either culverted or diverted into the surface water drainage system. Hither Green Ditch – whose course took it from just south of the Hither Green Cemetery to join the Quaggy close to Hither Green station, this includes a small unnamed tributary which is visible at Platform 5 at Hither Green along with a series of submerged tributaries flowing through the Corbett Estate. Chinbrook to Eltham Bridge – partly almost rural, partly encased in concrete – heading northwards from Chinbrook Meadows to (almost) Sutcliffe Park. The journey is now complete – although some posts will no doubt be revisited with updates. 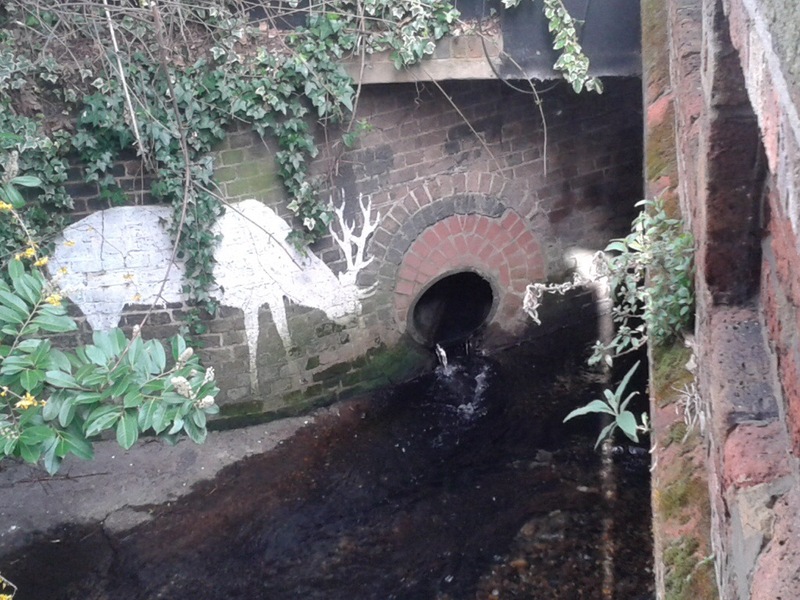 Running Past is moving on to the wider Ravensbourne catchment – if you want to receive updates follow me on WordPress or get e mail updates for new posts (see Home Page), ‘like’ me on Facebook, or follow me on Twitter (@running_past). Footnote – Ken White specifically allowed the copyright on the images in his booklet to expire on his death. Interesting website. My grandmother left Brockley at the time of her marriage in 1899 and I believe had a picture of Old Quaggy. There is a pond at the centre of the picture surrounded by grass with a large church in the background behind trees. Could I email the photo to you please? I have been trying to establish where the photo was taken for a long time. Thank you and of course you can – will send you an email later today. If I can’t identify I am sure I will be able to find someone who can via Twitter. When I was a kid in the 50’s, I lived off Crofton Lane in Romany Rise.At the bottom of the road was some green belt land. Beyond that was a farmer’s field then thick woodland. Beyond that was terra incognita – Bromley, around the bus depot – a place we never went. At the bottom of the green belt section, a stream separated it from the farmer’s field. The stream flowed in pretty much a straight line towards Petts Wood. It went underground near the Crofton Infants School. In the other direction, the stream flowed under Crofton Road near St. Paul’s Church. On the other side of Crofton Road, the stream sprang up in a thick wood of tall, seemingly-rotten trees. At the bottom of Romany Rise, a footpath led off sightly down to the left towards the stream. There was a bomb crater just before the stream, on the left side. I spent so much time there, observing the fantastic variety of wildlife. There were creatures in that crater that i have never seen elsewhere: hydra and cyclops water fleas, for instance. The only living things i noticed in the stream were freshwater shrimps.I have never heard of Quaggy,but it sounds weird. Would this stream be part of the quaggy system? I am talking about a time when the area between Crofton Road and the farmer’s field was just being developed for housing. It was called Gumping Common and there were three big trees in the middle, where owls roosted and dropped pellets. Once, we chased a badger there, in broad daylight! What great memories Ian! 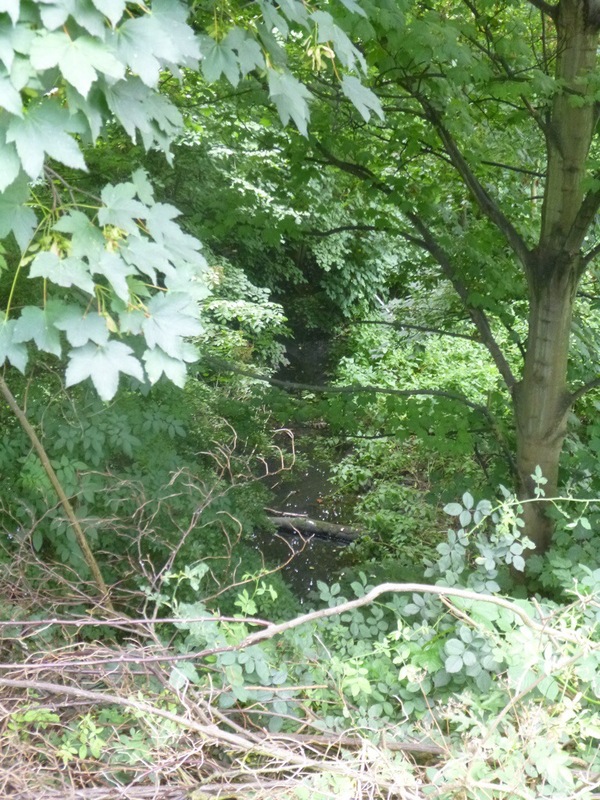 Yes that stream is part of the Quaggy catchment – the river is known as Kyd Brook at that point and there is more about that section here It is the eastern branch which rises in private land to the south of Farnborough Common. I will add some of your comment into the post at some stage. Thanks for visiting. At Crofton Lane school in fifties I regularly caught tadpoles and smooth newts in that bomb crater.We used to dam the kydbrook in the wood below the new school and catch sticklebacks all along Kydbrook but especially in the concreted section near Petts Wood Road. Skylarks nested by the dozen in the abandonned farmland on Left (west)bank.I left Crofton Lane Junior in 1959. In about 1962 when I was about 10 myself and a friend crawled through a concrete tunnel containing the Little Quaggy near Kippington Drive off the Sidcup Road, Mottingham and came up under a metal grill in The Tarn. We couldn’t get out so had to crawl all the way back. I can remember passing all the rainwater drain inlets from the road! It seems crazy because it must be at least 500m! The bottom of this tunnel had a central gully holding the flowing water with a large flat area either side. I later realised that when it rains heavily the tunnel fills up part way so we could easily have drowned. Wow! What fantastic memories! I suspect that a lot of us did similar things at that sort of age without understanding the potential consequences. With me it was hurtling down really narrow paths in a quarry on a bike with no brakes and massive drops on one side.